This is the second of my Polish pieces. I’m sorry that it follows on from the first after quite a gap – I’ve been hi-jacked by a nasty cold this week. I’ll try to be a bit more punctual from now on. 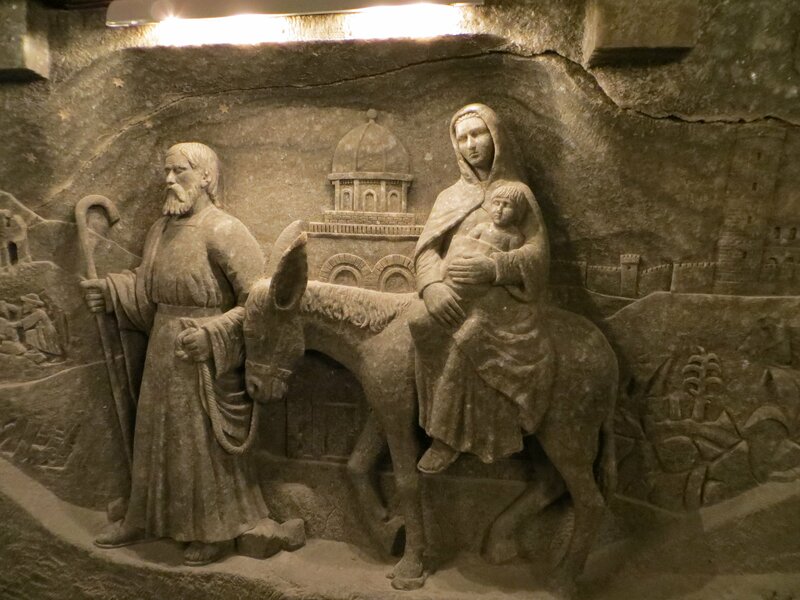 Cold notwithstanding, I should have preferred to get this post out earlier, because its main purpose is to share with you some photographs of our visit to the famous Wieliczka salt mine some seventeen kilometres outside Kraków. 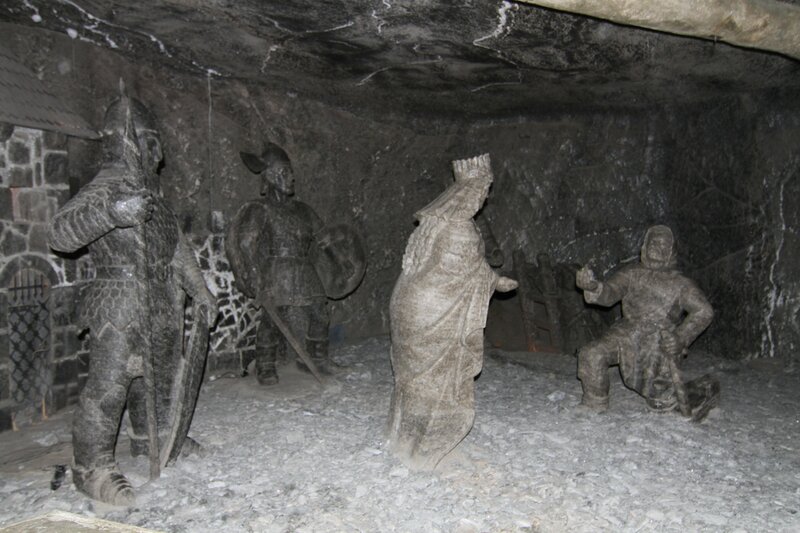 The chambers and carvings in the mine are spectacular – as you can see. Discovering them was an opportunity that we almost passed up, because we’re pretty averse to joining any kind of organised tour, and the salt mine is obviously not a place where tourists can be allowed to wander around on their own; indeed, so many tunnels are there, it would be very easy to get lost. We were persuaded to make the visit only the evening before, by some Danish people dining in the same restaurant. I suppose that making holiday plans on the advice of complete strangers about whom you know nothing and whom you’re never likely to see again is as good a way as any! In any case, I’m published by Salt and it therefore seems an appropriate kind of tribute to Chris and Jen Hamilton-Emery. Determined not to be an entire pushover to the tourist industry, we travelled to the mine on an ordinary service bus instead of one of the special tour buses. For me, one of the highlights of the day was encountering people from the suburbs as they travelled on this bus, though I was much less enthusiastic about the return journey in the afternoon, when the driver was clearly behind schedule and rattled along at such a speed that I had to face the back of my seat and hang onto it in order not to be thrown into the aisle. I was grateful that I hadn’t had lunch! I was also fascinated to note that, beyond the suburbs, Kraków has quite an industrial hinterland. 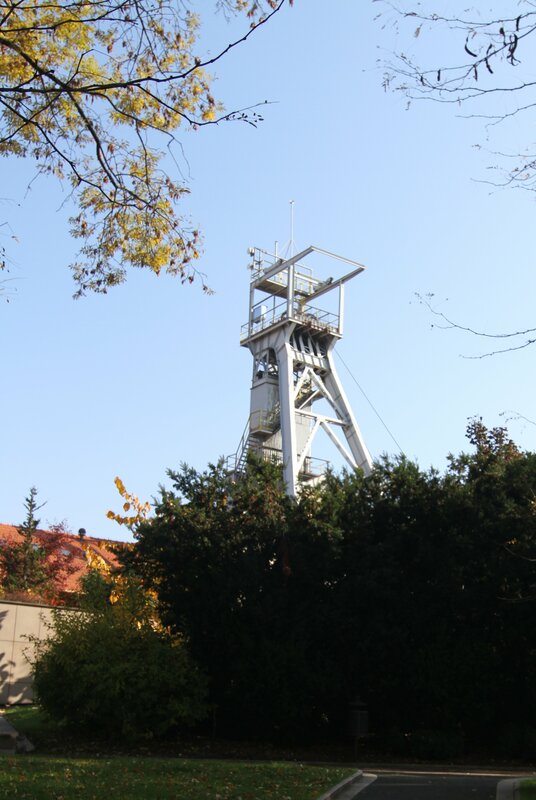 Tours at the mine are extremely regimented and quite expensive – entry costs about as much as a visit to the Tower of London, which is extortionate by Polish standards. The experience was also shot through with a slightly bizarre streak: for example, our tour was called a ‘non-tour tour’ (we worked out that this meant that we were not part of a pre-booked group). Endearing rather than annoying was how the enterprise running the mine tried to make money out of absolutely everything, from coffees and ice-creams to printed guides, knick-knacks made of rock salt and ‘genuine miners’ soup’, but in a slightly amateurish way. It is noticeable in Poland that everyone is desperate to make money, but in a friendly, almost apologetic, manner. The same thought struck me when I was watching the drivers of the horse-drawn carriages in the main square in Kraków trying to cajole tourists into taking rides. The non-tour tour guide was a young woman immaculately dressed in uniform. She was extremely professional and her English near perfect. She was obviously highly educated and very knowledgeable about the history of the mine, which has existed since mediaeval times. 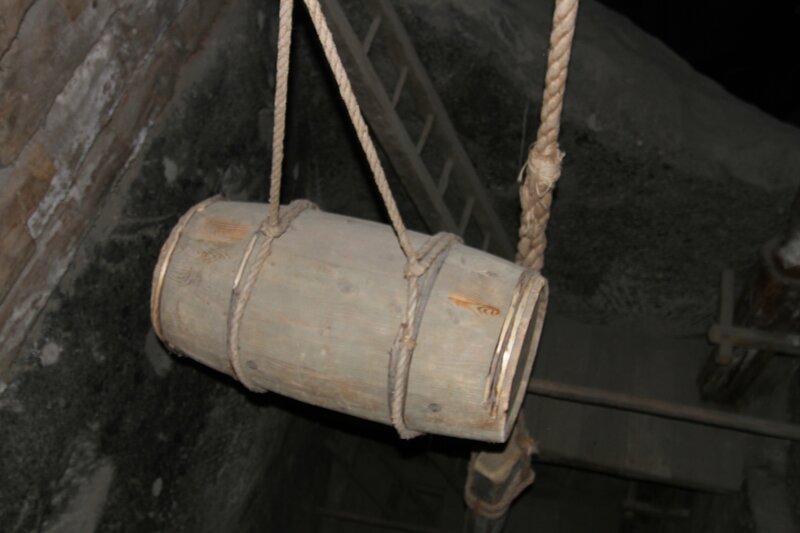 Rock salt was quarried there for seven hundred years, until 2002, after which the mine was devoted entirely to tourism. Engagingly, the guide explained that this was because more money could be made out of tourists than digging for salt. 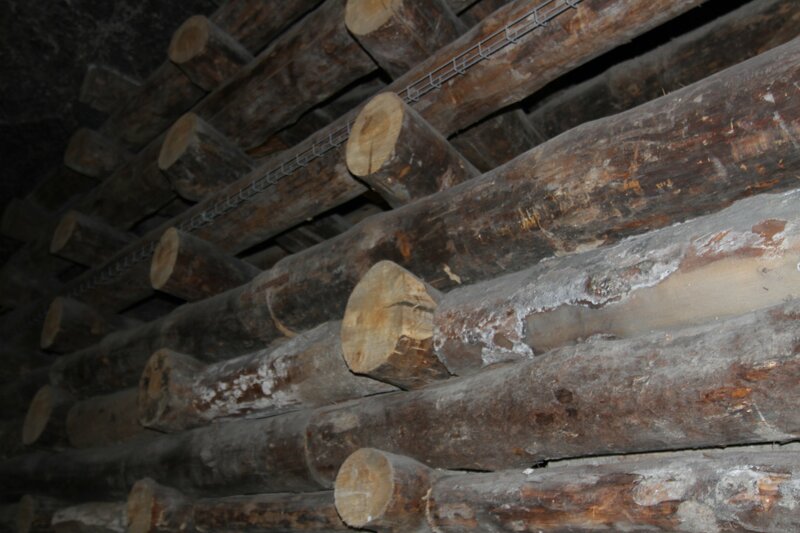 There is another commercial salt mine elsewhere in Poland, with much lower extraction costs, and that provides the supply. I was almost as interested in my fellow tourists as the mine itself. We were a jovial bunch from many countries; the only thing we had in common was that we had chosen an English-speaking guide, rather than one who spoke the other languages on offer: Polish, German, Dutch, French or Italian. Our group therefore included people from India, Japan, China and the USA, as well as several other Brits. I particularly admired the Indian couple, who gamely negotiated with two quite small children the up-and-down kilometres that we had to walk within the mine. The initial descent, down many short flights of wooden stairs within a vertical shaft, was neither frightening nor particularly taxing, if dizzily repetitive. Walking back up all of those stairs would have been a challenge, and might have caused a few heart attacks. Nevertheless, I didn’t enjoy the return to the surface, which had to be made in a small miners’ cage, crammed in with seven others. I was delighted to reach the exit and emerge into the warm autumn sunshine again. I’ve already written more than I intended, so I’ll leave the pictures to speak for themselves now, just adding that all the sculptures and carvings – and indeed all the floors – in the mine have been fashioned from rock salt and that (although it is probably self-evident) Polish salt miners were very devout, some of the chambers having been turned into chapels, the most impressive being the Chapel of St. Kinga, which, with its altarpieces, wall-friezes and statuary, as well as carved floor, all in rock salt, is like a cathedral. The caverns are astonishing in scale (the Staszic Chamber has a ceiling thirty-six metres high), in some cases with self-supporting ceiling, in others prevented from collapse by elaborate wooden prop systems or by much more modern metal rods, inserted into drilled holes and therefore much less obtrusive to the eye. Hi Christina, hope you feel better soon. 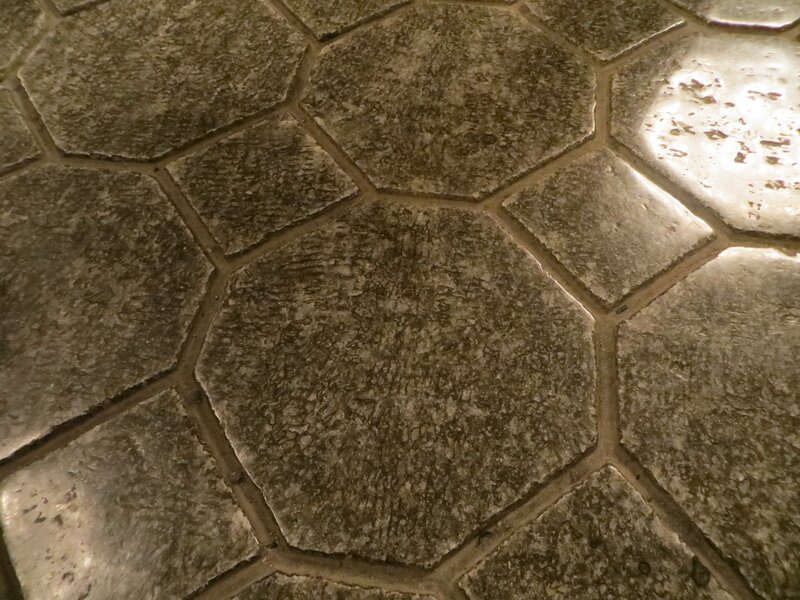 I have seen this Salt Mine of T.V., it looked fabulous, your photo’s have confirmed it. A wonderful post – you’ll have to take up travel writing! Marjorie, you are just the kind of stalwart supporter I need this week! Lovely of you to comment like this; you’re making me feel much better! 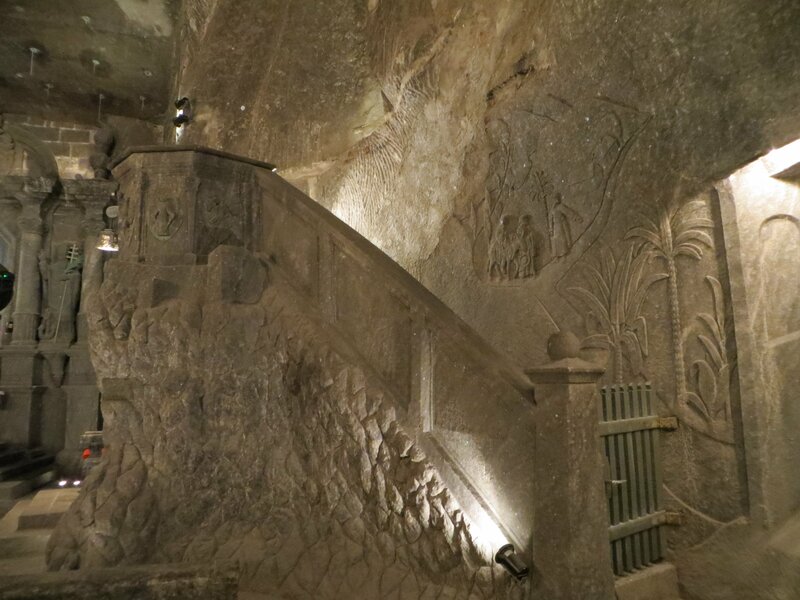 The salt mine is astonishing; apparently just three men were responsible for the Kinga Chapel sculptures. I’m not surprised that it was televised. I understand the cash-harvesting business. I’m always embarrassed when I go to Ireland over the huckster-like attempts at profiteering. I think the same dog-and-donkey tin-whistle show (literally, dog and a pony) has been at the Cliffs of Moher for 50 years. Maybe they got a new donkey. Really, the culture isn’t about extorting money from tourists based on sentiment. Really it isn’t. Okay. So it is. You got me. Hope you get some rest and kick the cold. Christina, I haven’t been to the Salt mines either, and neither has Koos, but they look wonderful! Very appropriate for you too! Poland still has so much poverty, it’s not surprising people try and make a few extra coins out of the tourists. I’ve seen women selling single flowers and solitary pieces of fruit on the streets of Katowice. I have enjoyed your Polish posts very much. 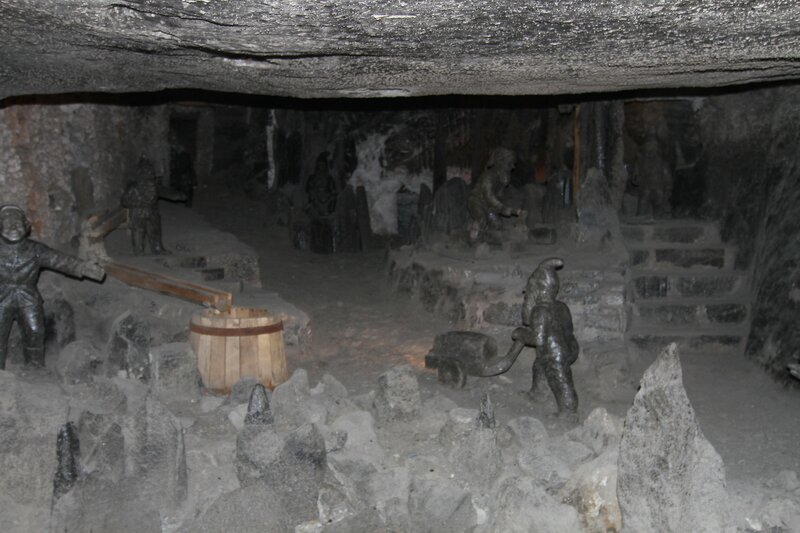 There are other salt mines around Europe, apparently; my son visited one in Romania in 2006, where, he says, the health and safety standards I experienced in Poland were not in evidence; he enjoyed the experience, however. We thanked the horse-drawn carriage and electric city-tour truck drivers for their efforts to win us over and engaged them in conversation; they were very pleasant and keen to talk, quite different from the hard-nosed, hard-bitten tourist-trappers we’ve met elsewhere in European hotspots. I’m really pleased that you have enjoyed the posts. Thank you, Valerie! 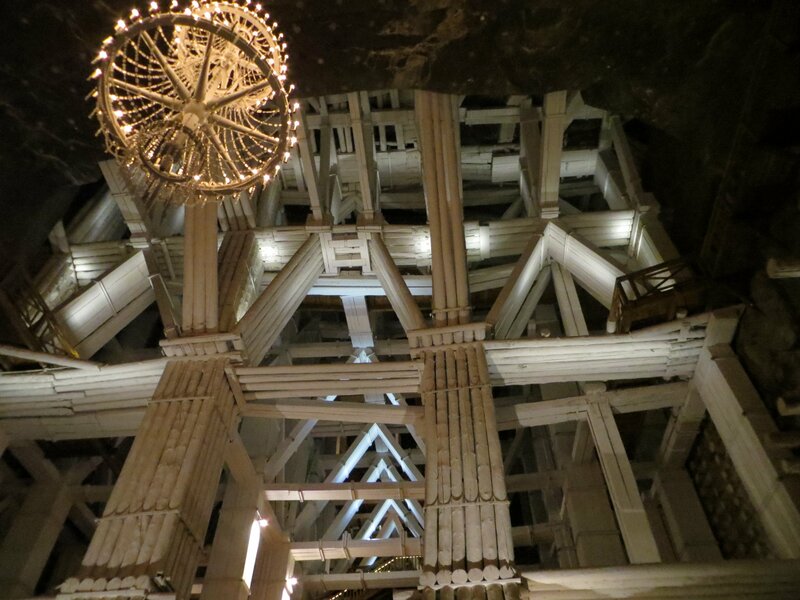 Years ago – in my teens – I went down a salt mine in Austria. We rode up the mountain in the back of a post van – so thrown about all over the place like a parcel. Then we had to get into onesies (no hard hats though, this was a long time ago) and were led into the mine.